Datacenters, vast warehouses containing millions of servers that run the internet and the cloud, have experienced double digit growth for almost two decades. Datacenters cost hundreds of millions of dollars, with the largest now exceeding over a billion dollars each, and consume enormous amounts of power--over 2% of all electricity in the US and projected to increase up to 10% by 2030. The impact of such high compute density, with thousands of individual compute nodes packed together in a small space, is heat: every watt of power used by servers must be removed form the datacenter. Datacenters primarily server user facing workloads, that is: the user requests a search or sends and email and their query prompts load in the datacenter. This creates a diurnal load pattern whereby datacenters are most heavily loaded during the peak hours when users in their region of service are awake and active online versus the off hours when users are offline or asleep and query requests are low. Because datacenter infrastructure must be provisioned for peak load, servers, power distribution, and cooling infrastructure is significantly underutilized most of the time. This dissertation investigates the cooling needs of datacenters, and proposes to decouple the work and cooling needs. Specifically, we hypothesize that by storing thermal energy we can reshape the thermal profile of a datacenter to better balance cooling load throughout the day. We call this technique Thermal Time Shifting (TTS). 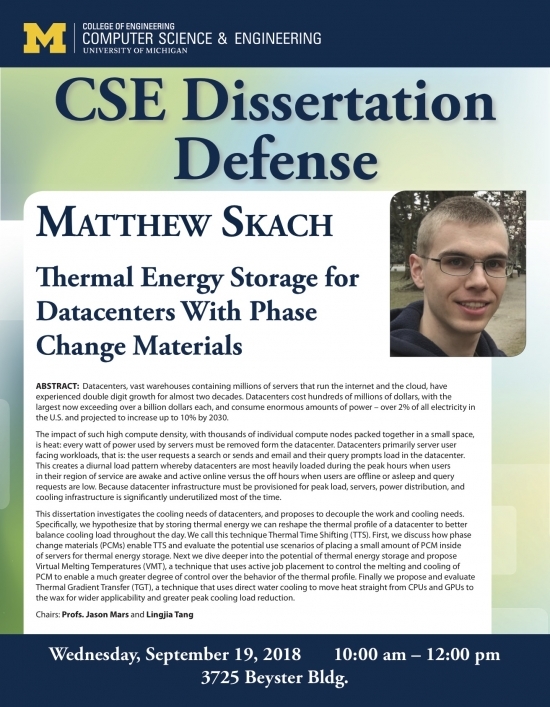 First, we discuss how phase change materials (PCMs) enable TTS and evaluate the potential use scenarios of placing a small amount of PCM inside of servers for thermal energy storage. Next we dive deeper into the potential of thermal energy storage and propose Virtual Melting Temperatures (VMT), a technique that uses active job placement to control the melting and cooling of PCM to enable a much greater degree of control over the behavior of the thermal profile. Finally we propose and evaluate Thermal Gradient Transfer (TGT), a technique that uses direct water cooling to move heat straight from CPUs and GPUs to the wax for wider applicability and greater peak cooling load reduction.